Barbara Lee Wharam, 68, of Gladstone passed away Saturday, Feb. 9, 2019 at Lynchburg General Hospital. Born in Charlottesville, Oct. 5, 1950, Barbara was the daughter of the late James and Navy Roberts Wharam. 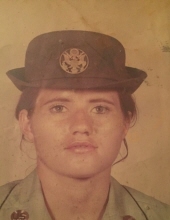 She was a U. S. Army veteran of Viet Nam, a retired seamstress and attended Bethel Baptist Church. In addition to her parents, she was preceded in death by an infant daughter; two step-sons: Ralph and Bobby Tyree; two brothers: Jackie and Howard Wharam; two sisters: Joyce Wharam and Virginia Marie Gibson; and two grandchildren: Cindy and Mindy Childress. She is survived by her spouse of over 44 years, William F. Tyree; three children: Keith Wharam (Sarah Elliott);Olivia Ann Childress (Hershel); and Crystal Elizabeth Wharam all of Gladstone; four step-children: Angela Marie Dodd of Amherst, Jennifer Mae Sharp (Norman) of Evington, Melissa Cash of Madison Heights and Esther Elliott (Mark) of Campbell County; one sister, Lilly Goolsby ( Kenneth) of Afton; 12 grandchildren: Katelyn Wharam, Landon Childress, Nathan Childress, Alexis Wharam, Trafton Wharam, Blake Johns, Jackson Dodd, Gavin Sharp, Mia Vangas, Micah Vangas, Jessica Cash and Mason Hall; and one great grandson: Ezra Johns. A celebration of her life will be held at 3:00 pm, Saturday Feb. 16, 2019 at Driskill Funeral Chapel with Pastor Russell Snoddy officiating and military honors by American Legion Post #16. The family will receive friends from 1:00 pm until 3:00 pm Saturday at the funeral home and Saturday after the funeral , at Bethel Baptist Church, Amherst. Interment will be in Amherst Cemetery. To send flowers or a remembrance gift to the family of Barbara Lee Wharam, please visit our Tribute Store. "Email Address" would like to share the life celebration of Barbara Lee Wharam. Click on the "link" to go to share a favorite memory or leave a condolence message for the family.